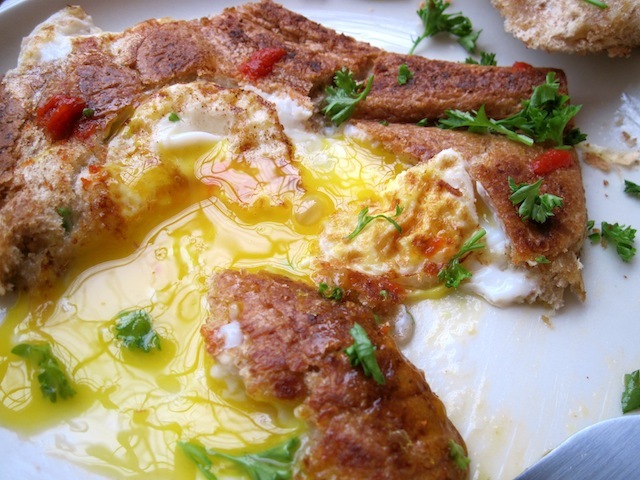 Breakfast is Beautiful – Eat Me. Drink Me. I have been trying to write this post for a while. I’m not really sure why it’s so hard for me to articulate what I want to say, because really, it comes down to this: breakfast is great. And sub-points: breakfast is great because of the epic struggle for supremacy between variety and ritual. 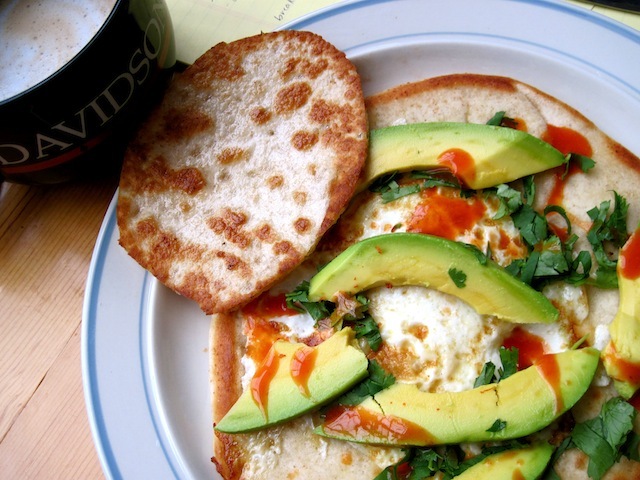 Today, for breakfast I am eating a pita fried with two over easy eggs and topped with cilantro, avocado slices, and hot sauce. But it could just as easily have been oatmeal. There are so many breakfast options. Toast, pancakes, waffles, cold pizza, bagels with cream cheese, herring and crackers, biscuits, bacon, homefries, hashbrowns, cereal, müsli, grits. Let’s not even get into eggs. With all those delightful choices, how could you limit yourself to the same thing every day? Most people breakfast alone. The unspoken rule is that plus one makes brunch. This could be because brunch is festive (this, in turn, could be because it’s still faux pas to have bloody marys with breakfast). Or it could be because we each have morning rituals, performed in solitude, to gather energy and sanity for the rest of the day. 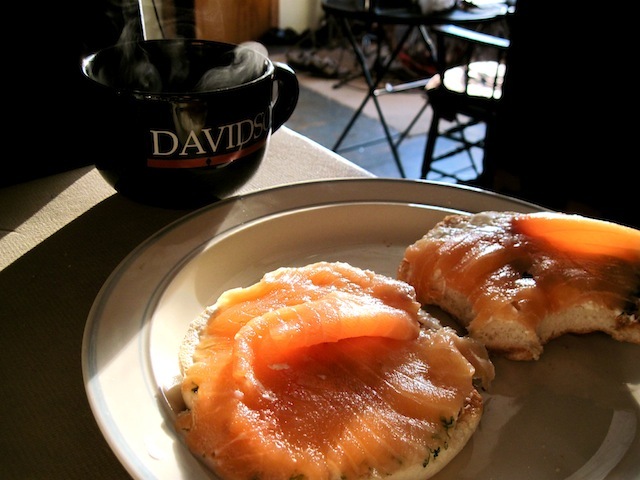 When and how I make breakfast is a part of my silent, calm morning time – the actions themselves rituals. I’ve been waking up early recently to do writing in the morning when my brain is fittest (post-college, I realize that I’m a morning person). So I wake at 8:30, crawl down from my loft, brush my teeth, sit at my desk and try to form my first coherent thought, pick the clothes up off the floor from where I threw them the night before, and go make breakfast. Then, I sit here looking out at the freshly fallen snow (Editor’s note: see how long I’ve been trying to write this?! It was 74 degrees the other day) through my floor to ceiling windows, making sure the ratio of egg yolk to sriracha to parsley to buttered toast is just right and being warmed by hot cappuccino and the space heater plugged in next to me. Having a morning routine does not necessarily mean eating the same thing every breakfast, though it might. One of my roommates, for instance, eats two pieces of toast spread with hummus and topped with two soft-boiled eggs every morning. Every morning, my father has a cup of coffee and a slice of toast with marmalade or apple butter. 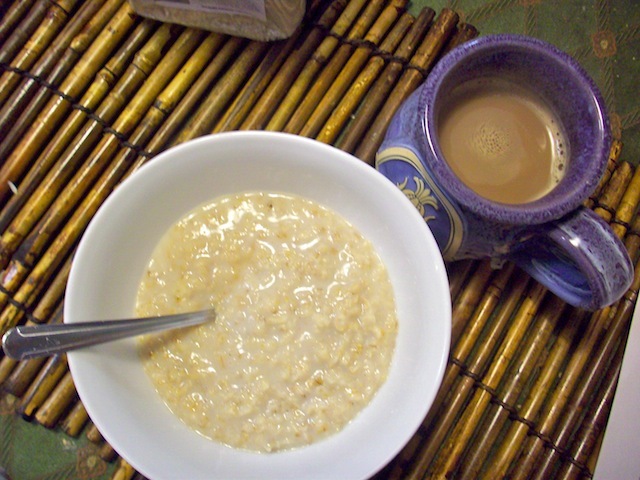 Until it began to conflict with his current diet, my grandfather ate oatmeal every morning for breakfast. I find myself to be somewhat of a rogue breakfaster. Other than my morning cappuccino made with Illy espresso, frothed milk, and sugar, anything goes. (Editor’s note: Finding the coffee mug in these pictures is sort of like playing Where’s Waldo.) Since moving to Brooklyn, I have made some beautiful breakfasts. Some of my most brilliant creations have evolved out of a desire to use up leftover food in the fridge. 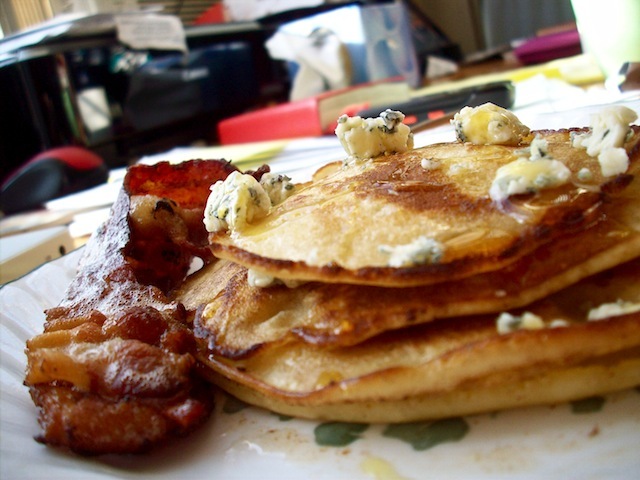 See: a stack of pancakes topped with bacon, crumbled blue cheese, and agave nectar. 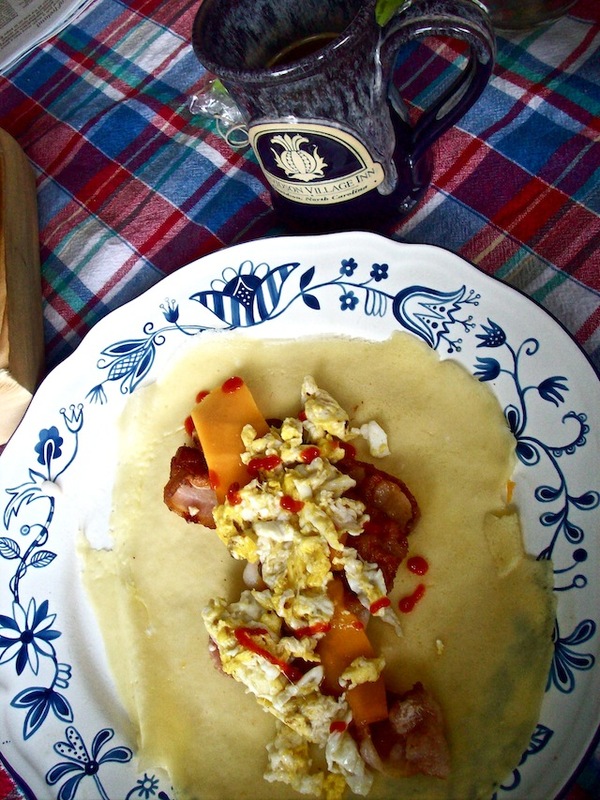 My breakfasts are not always complicated. Sometimes, I boil an egg. Or stick a Pop Tart in the toaster. Or have a bowl of Honey Bunches of Oats. My current breakfast binge is a toasted bagel with cream cheese, which is straightforward enough. Let me explain the tension: In the morning, life is still uncomplicated (ok, this is so, so poetic-general). 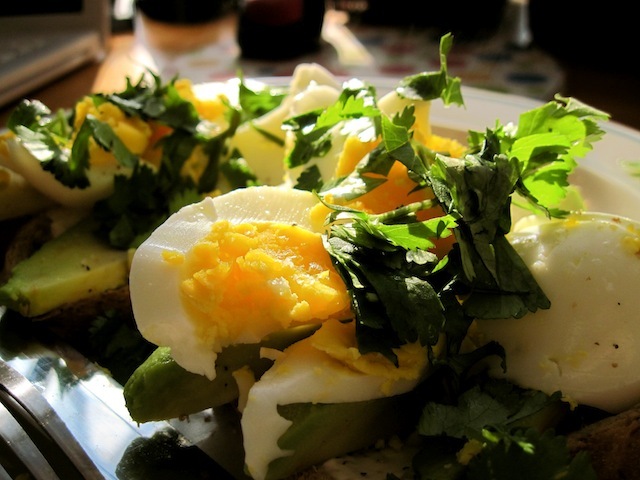 What to eat for breakfast is the first real choice you have to make for the day. What do you want that will focus your mood and energy and what do you need? Most of us are probably not conscious of making these choices, being still sleep-groggy. But it’s the reason you choose Earl Grey and buttered toast instead of waffles and syrup. What all of my breakfasts have in common is that they are chosen based on how I feel within the constraints of my morning ritual. Variety within ritual. Take that, great white sharks. In other news, I have started writing a weekly food column for the blog Glasses Glasses, so if you want to join the game called “Lyz tries to find something creative to write about food at least once a week,” check it out! I love you and your blog. Le sigh. And good luck with your food column! awww… thanks colleen! i love you too! is this a good forum to mention that i really enjoyed reading through your wedding website? Your breakfasts are decadent, exciting and delicious. If I ate them every day, I would be dead in a month.